“One year to save the planet from climate change disaster.” Those words were uttered by Ed Davey, UK Government’s secretary of state for Energy and Climate Change, ahead of the United Nation (UN) Climate Change Conference held in Lima, Peru, in December 2014. Energy managers are often coerced, whether because of legislative environmental directives or self-imposed responsibility, to find and implement alternative energy efficient solutions to reduce their greenhouse gas emissions. The spin-off benefits are lower energy bills and increased bottom-line profitability. Compliance with regulation and achieving energy cost reductions have become the necessary bedfellows. Combined heat and power (CHP), otherwise known as ‘cogeneration’, is a long-established and well-advanced technology for lowering operational costs. However, its relevance to Ed Davey’s comment is now even more important in the context of reducing energy consumption. In the wake of the Lima conference and in advance of the forthcoming UN summit in Paris in December 2015 to achieve legally binding and universal agreement on future climate change action, limiting and reducing harmful man-made changes to the ecological state of the Earth’s atmosphere is at the top of the agenda for the 196 participating countries. CHP is the simultaneous generation of electrical power and heat for process use achieved with higher levels of energy efficiency and lower emissions than possible as separate entities. The reduction in fuel used, while displacing fuel consumed by central generation stations helps achieve environmental policy objectives. Gas turbines and gas engines (the prime movers for cogeneration) are among the cleanest fossil-fueled power generation equipment commercially available. The main advantage of CHP installations over conventional arrangements—where power is imported from the grid and heat for process use is raised on-site—is that, the heat contained in the exhaust gasses is produced at negligible cost as a by-product of electricity generation. The most common use for this exhaust gas energy is the recovery of the heat for conversion into useful thermal energy. This is usually in the form of steam or hot water in a heat recovery heat exchanger or as a source of direct energy for process fluid heaters, or for pre-heating of combustion air for fired boilers. The steam produced may also be used to drive a steam turbine in a combined-cycle plant. A major concern for the CHP designer often is the fluctuating nature of the process steam demand to be met. Many systems use supplementary firing in or before the heat recovery steam generator as means of increasing system flexibility to compensate for variances in the power load or process steam demands. However, control of steam production cannot be fully accounted for in the design of most CHP plant without additional measures. The demand for steam from industrial processes is invariably erratic and step changes in load can have a detrimental effect on efficient power and steam production. The electricity generator in many cogeneration applications is sized to run most economically at full output. Therefore, when less than full power is required due to a drop in steam requirements, the efficiency of the turbine or engine reduces and emissions increase, especially at half load and below. So it is almost always the case that standby boilers and supporting auxiliary services are also required in the CHP system to supplement process steam supplies when required, or at maximum demand rate in the event of a CHP plant trip. In such circumstances, even with auxiliary back-up, it is almost inevitable that the production of process steam falls and distribution pressure (and temperature) will be lost because of the inherent lag in auxiliary system response. However, a solution to these problems exists that not only removes the effect of transient steam loading completely from the CHP plant, but also reduces or eliminates the need for auxiliary steam plant with all the attendant fuel and operating costs. It is the incorporation of a steam accumulator into the steam supply system. Steam accumulation is a long-established but often forgotten technology that if correctly applied can continue to enhance the design and performance of CHP plant and in the modern boiler house. 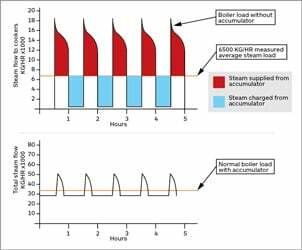 The purpose of a steam accumulator in CHP applications is to provide the means to convert an irregular process steam demand into a steady load. This enables the sizing of the electrical generator to be matched to the power demand and for it to run continuously for longer periods at full output and maximum efficiency. In view of the ability of the accumulator to discharge steam instantaneously from ‘storage’ to meet sudden changes in demand, pressure in the steam distribution system is held constant. Under a CHP plant trip, the standby boilers are given time to run up to full output and the interruptions that would otherwise occur need not be tolerated. Imagine a boiler that can reach a peak demand 10 times higher than its rated output. Consider that two out of a bank of three boilers might be eliminated and still allow the remaining boiler to reach the same peak. Contemplate maintaining a low-pressure steam supply while diverting the boiler output to critical high-pressure consumers. These are just three examples of the many applications possibilities for steam accumulation. Steam is an essential commodity for many industrial processes. The technology can be successfully applied to any manufacturing process where steam is used for batch processing or at highly fluctuating rates. These conditions can be found in food production, canning, distilling and brewing, chemical manufacture, textiles, rubber, paper and board, plastics, pharmaceuticals, steel making, laundries, ammunitions, brick and concrete curing, turbine testing, tire manufacture and CHP. 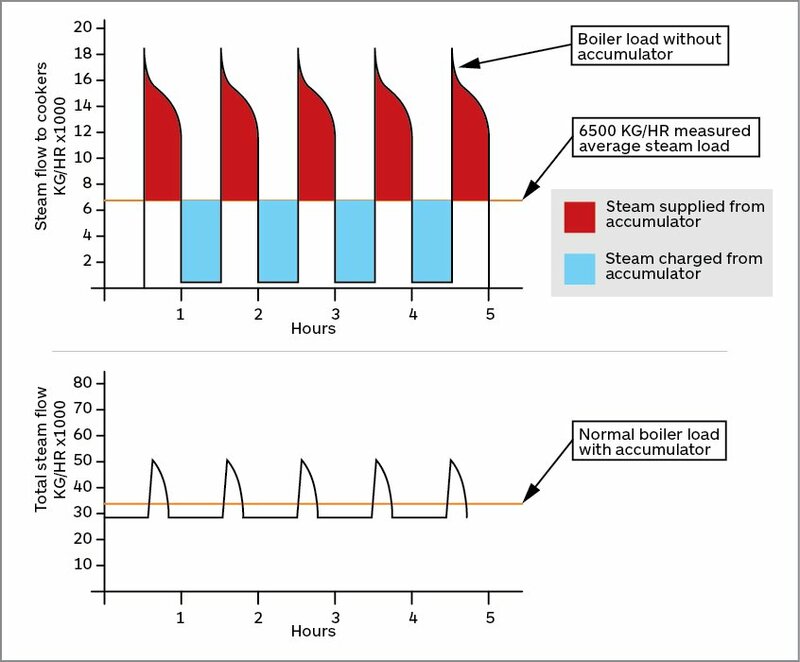 Variable steam demand profile showing the load balancing effect of a steam accumulatorThe potential benefits can significantly lower energy costs through increased operating efficiency, a secure and immediate response to the steam demand, the assurance of constant product quality and where new boiler plant is required, lower capital cost and crucially achieving all this whilst reducing environmental pollution. Steam accumulation is the storage (in a pressure vessel) of surplus steam produced at times of low demand for subsequent release to supplement the output of the boiler at times of high demand. Any industrial manufacturing process having a variable demand for steam and where an effective differential exists between boiler and process pressures can benefit from this energy efficient technology. The term ‘steam accumulator’ is a misnomer and a more apt description would be ‘heat accumulator’. This is because water (not steam) is used as the heat storage medium. The reason becomes evident when the greater heat storage capacity of water is compared with that of the same volume of steam vapour at any given state of temperature and pressure. Most accumulators work on the ‘pressure-drop’ or ‘sliding pressure’ principle whereby steam from the boiler (or HRSG in the case of CHP) is charged at high pressure into the water and steam for process is discharged from the water (flashed) at low pressure to meet the demand. The size of the storage vessel depends on the difference in pressure raised in the boiler and that of the pressure required by the process, and the amount of storage required. Storage vessels can range in size from 1m3 to 150m3in volume (and more), or be a multiple of vessels to achieve the required storage volume. Charging of an accumulator takes place when ‘surplus’ or ‘excess’ steam from the boiler is condensed in the water space of the accumulator. This is achieved by directly injecting the steam into the water by means of special charging nozzles. The total heat of the steam is given up to the water resulting in a continuous rise in the temperature of the water. This process continues until the corresponding pressure in the vessel has reached that of the charging steam. What Happens When Steam Is Released? Discharging takes place when the steam in the head space above the water is released (by opening the outlet valve), which causes a momentary reduction of pressure leading to an imbalance of that lower pressure with the saturation temperature of the storage water, whereupon the surface water starts to boil and more steam is released as ‘flash evaporation’ to replace the released water. The evaporating steam carries away with it the latent heat of vaporisation and this process may continue for as long as steam is required to be discharged. Eventually the accumulator pressure will fall to the minimum required by the process being supplied and at that point the accumulator is effectively exhausted, requiring to be recharged. The application of the technology has changed markedly since the era of cheap energy. At that time, storage vessels were overly large, coal burner response was slow and control was relatively uncomplicated by today’s standards. The main purpose of accumulator control was to enable the steam supply plant to reach an otherwise unreachable peak, but did not reflect the need to maximise boiler efficiency. Currently, the picture in the modern boiler house is different and the need for industry to continuously reduce its energy bill through improved operating efficiency is a priority. The latest accumulator control methods are a far cry from those of the old days and are now designed to optimize boiler efficiency in conjunction with today’s modern burners. Matching the amount of steam stored to modern burner performance, connecting the storage to the steam supply system in the most effective way, and customizing the microprocessor accumulator controls are the keys to a successful installation. Control systems that continuously balance the boiler load to a varying ‘average’ rate, thus allowing the installed storage capacity to be minimized, and others that utilize the modulating capability of modern burners, but at a gradual rate of change in response to a sudden peak demand are typical examples. A reduction in on-line generation capacity leads to practical improvements in boiler operation. Balancing the boiler load removes the adverse effects of load fluctuations on steam conditions, which are boiler pressure, steam temperature and dryness. Without the storage of steam, all load variations lead to some pressure change, whereas with an accumulator interposed between the boiler and the process, the pressure can be held constant. Also, the elimination of high and low boiler water lock-outs due to wide load swings has positive advantages, not only for manufacturing processes, but also for power generation. The reliability and simplification of the steam supply, the maintenance of steam conditions and the existence of a steam ‘reservoir’ are operational advantages that improve working conditions. Being capable of release at relatively high rate and in large quantities, the steam held in storage in the accumulator also secures the needs of production and the conditions to maintain product quality. The most important energy cost savings to be gained from steam accumulation derive from a reduction in the boiler output in combination with load stabilization. Fuel consumption arising from a highly fluctuating boiler load will vary with the degree of control sophistication of the combustion equipment used. However, in almost all cases, there are prospects for energy savings emanating from the elimination of excess steam generating capacity and part-loading that causes a low load factor; and the removal of a rapidly fluctuating demand and idle live capacity that increases standing heat and power losses. Therefore, the possibility of a steam accumulator meeting a fluctuating steam demand with a smaller boiler operated at a higher load factor and at constant output with higher efficiency is an alternative energy efficient solution that should not be ignored. The economic case for steam accumulation will vary depending upon individual circumstances and as such predictions on energy savings and operational gains can only be generalized. However, a conservative expectation of improved boiler combustion efficiency for modern burner equipment using the latest accumulator control methods could be between 2% to 4%. For older boiler plant, the saving could be more, perhaps 3% to 5%, depending on the type of boiler, state of maintenance and conditions under which the boiler is operated. The necessary data, where modern boiler and burner equipment are installed, from which to derive the required information will likely be readily available from the existing energy management system, but with older plant where scant information is available the addition of the necessary temporary or permanent instrumentation could be easily provided. Standing heat and power losses resulting from excess on-line boiler generating capacity could equate to 1% to 3% of fuel consumed relative to the maximum combustion rating of the boiler. Where a boiler is of large refractory construction, savings on maintenance could have an even greater impact on the case for investment. Fewer boilers on-line operated under steady load conditions would lead to less ‘wear and tear’ and as a result lower maintenance costs. The potential for labour and material cost savings may be easily examined, but safe to say a reduction in operating costs would contribute significantly to enhancing the case for steam accumulation. Energy storage for power generation has entered a significant stage of development. Establishing a low carbon economy requires the fluctuating nature of the power supply generated from renewable energy sources to be managed. There are now various grid-scale and R&D developments for electrical power storage being investigated—some dependent on government subsidies, others funded by private and academic initiatives. These include flow batteries, compressed (liquefied) air and lithium cell technologies. Electrical power produced from concentrated solar power plant, which raises steam to drive a turbo-generator cannot be maintained during the hours of darkness or diminution of sunlight without some form of energy storage and this can impact detrimentally on the feasibility of new build projects. Steam accumulation can provide large-scale indirect storage of electrical power by accumulating excess steam produced by the steam generator for later release to drive the turbo-generator. Its purpose can be to maintain power output when demand exceeds supply or to balance a variable load. Disparity between power demand and supply is at the heart of the economic and operational problems to be solved by the solar power plant designer and steam accumulation is one solution that can provide the answers. Industrial size accumulators can be very large, but there is no practical limit to size, storage capacity or operating pressure of the storage vessels to balance demand variations or maintain electrical power output at the levels required. The commercial and economic arguments for the use of steam accumulation in the power generation storage mix have to be made for each individual circumstance. However, technological viability need not be seen as a barrier to further investigation of the potential for steam accumulation in this important emerging sector.